Authors:Arthur Aron, Arthur Aron Ph.D., Elliot J. Coups, Elliot Coups, Elliot Coups Ph.D., Elliot E. Coups Ph.D., Elliot J. Coups Ph.D., Elaine N. Aron, Elaine N. Aron Ph.D.
Statistics for The Behavioral and Social Sciences 5 Edition For one-quarter/semester courses that focus on the basics in statistics or combine statistics with research methods. 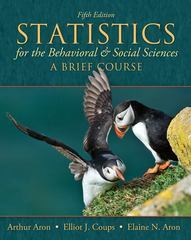 The fifth edition of Statistics for the Behavioral and Social Sciences builds off an already well-established approach - emphasizing the intuitive, deemphasizing the mathematical, and explaining everything in direct, simple language - but also goes beyond these principles to further student understanding. By using definitional formulas to emphasize the concepts of statistics, rather than rote memorization, students work problems in a way that keeps them constantly aware of the underlying logic of what they are doing.